Hygenn X (or Hygeen X) As the marriage of the Coffee Fiber Padding and Silver Lining Embroidery Vertagear fans love, Hygenn X was designed with a patented coffee infused fiber to limit odor and increase breathability, while maintaining bacteria control properties from the silver thread to prioritize cleanliness and comfort in the areas most sat on during long hours of intense gameplay. Silver Lining The PL4500's embroidery is made out of silver thread. Silver is long hailed for its antibacterial properties. Silver interrupts bacteria's ability to form chemical bonds critical to its survival, so when bacteria meets silver, it falls apart. Ultra Premium High Resiliency Foam Our interior foam boasts a density that puts it well above the standard High Resiliency foam. Where High Resiliency foam sits at approximately 2.5lbs per cubic foot, inching it near the realm of memory foam. The elasticity of the foam helps prolong the comfort life of the chair and adds to the overall durability of the product. Heavy Duty Metal Base Frame The PL4500's heavy duty base frame is constructed with industrial strength metal to support up to 200kg / 440 lbs of weight, for long lasting comfort. Soft-Glide Wheels The PL4500 comes with 65mm/2.5" PENTA RS1 casters that are engineered for quieter operation and greater resistance to foreign objects and debris, rolling effortlessly on all types of flooring while preventing damage to the surface beneath. 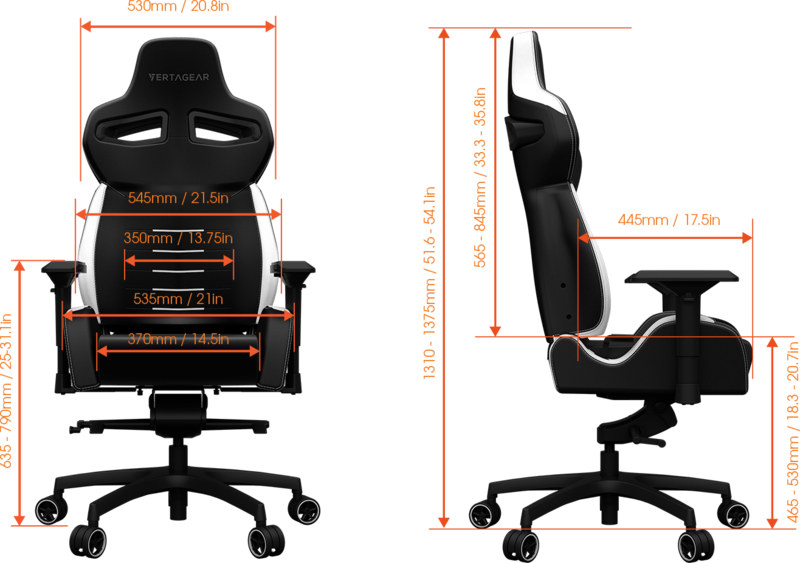 Adjustable Seat Height The PL4500's seat and height adjustability ensures correct ergonomic posture and prevents stress to your back. Having good range of adjustability allows you to be at an optimum angle in relation to your desk, this reduces back and neck pains. Adjustable Tilt with Locking System Our adjustable tilt tensions mechanism allows you to increase or decrease the tension by easily turning the knob to match your body weight. This allows you to rock comfortably, without heavy pushing, reducing muscle fatigue. In addition, the Racing Series P-Line can be locked into 4 different tilted positions, truly putting you in a driver's seat. Adjustable 3D Armrests Ergonomically designed to contour to the shape of the arm, the arm rests can be adjusted in 3 different points to provide proper support to the forearm. As the marriage of the Coffee Fiber Padding and Silver Lining Embroidery Vertagear fans love, Hygenn X was designed with a patented coffee infused fiber to limit odor and increase breathability, while maintaining bacteria control properties from the silver thread to prioritize cleanliness and comfort in the areas most sat on during long hours of intense gameplay. The PL4500's embroidery is made out of silver thread. Silver is long hailed for its antibacterial properties. Silver interrupts bacteria's ability to form chemical bonds critical to its survival, so when bacteria meets silver, it falls apart. Our interior foam boasts a density that puts it well above the standard High Resiliency foam. Where High Resiliency foam sits at approximately 2.5lbs per cubic foot, inching it near the realm of memory foam. 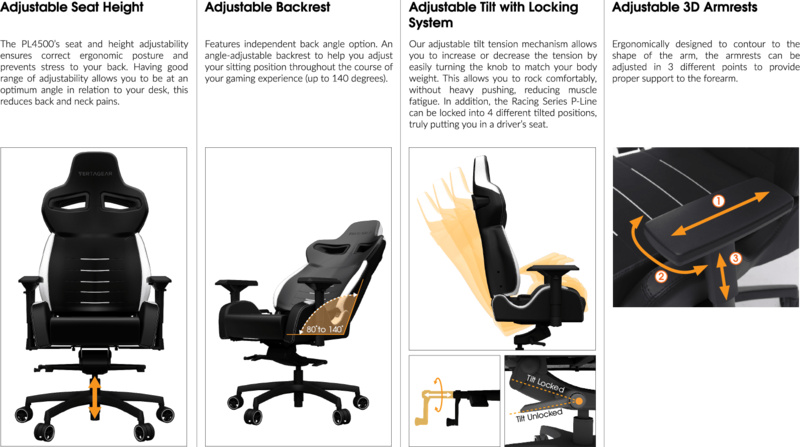 The elasticity of the foam helps prolong the comfort life of the chair and adds to the overall durability of the product. The PL4500's heavy duty base frame is constructed with industrial strength metal to support up to 200kg / 440 lbs of weight, for long lasting comfort. The PL4500 comes with 65mm/2.5" PENTA RS1 casters that are engineered for quieter operation and greater resistance to foreign objects and debris, rolling effortlessly on all types of flooring while preventing damage to the surface beneath.